Happy holiday season, cat lover! I hope this message finds you and your furry family well! I have three cat-centered discoveries to share with you today. If your life is anything like mine (aka, you’re human), the holidays don’t look like a Christmas movie every year. 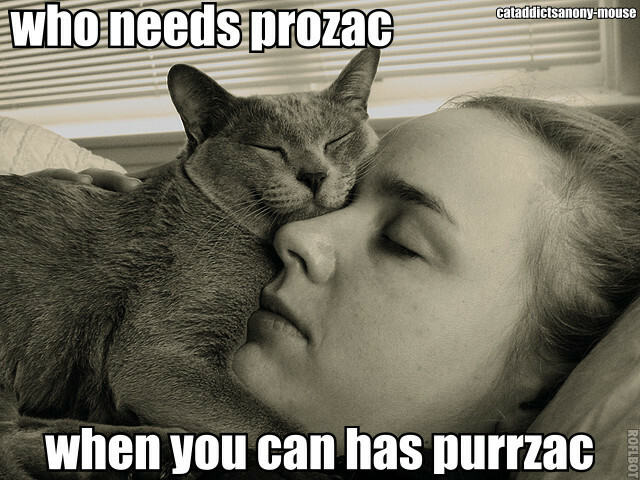 So please, indulge yourself and your cat in some purr therapy. I once wrote an article about research on this (to which many people have added their own moving personal stories). And, a designer created this pretty cool infographic that cites that article and others: Healing power of cat purrs infographic. Nicely done! 2. Happy news from the “What to feed cats with feline IBS, diarrhea, or frequent hairballs” page + a TIP from me. TIP: We often feed Rad Cat and it’s my #1 cat food choice, but I want to add that our cats can get constipated on Rad Cat and ALL high-quality, low-fiber, grain-free wet foods. We resolved this by giving them 100% pure canned pumpkin (about 1/2 to 1 tsp per day or every other day) with their food. Our cat Joel loves pumpkin no matter what, but our cat Phil requires it to be mixed in (hidden). 3. Gift idea for you and your cat: how about beautiful, visual how-to’s for Catify-ing your home? Catification: Released last year. This is all about making those fabulous feline super-highways. See some examples here. 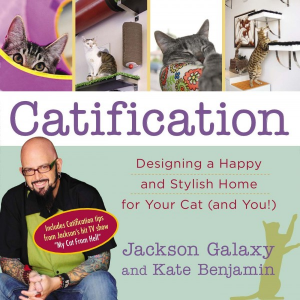 Catify to Satisfy: Simple Solutions for Creating a Cat-Friendly Home: New. This touches on more super-highway concepts and ideas, but also includes various other projects that help make sure your cat is happy and healthy and has the best scratching and litterbox experiences – you know, the kind you want them to be having in your home! I’m hoping you and your cats get everything on your wishlists! See you in 2016! Rad Cat uses oyster shell for it’s calcium source..not ground bone.. as does, for example, Primal and most of the other raw foods. I’ve been told that the oyster shell is better in terms of the constipation issue. Liz…what do you think?? Hi Judith, I haven’t looked into oyster shell as a calcium source yet, but my understanding is that Rad Cat uses egg shell and that any powdery source like that is going to be easier on cat digestion (eg, constipation)! Thank you Loretta! That sounds frustrating, so I looked it up on Rad Cat’s Where to Buy page: http://www.radfood.com/where_to_buy. Good news – when I enter just New York (no city or zip code) I get 94 stores in the state of New York — so maybe there is hope! Even though I’m financially-challenged, I love reading about ways to improve my two cats’ quality of life, as well as things I can try with little to no cost. Thank you so much for your informative blogs!!! “High Paws” from Prince Charlie and Princess Tashi. . .
Aww, thanks Diane, Charlie, and Tashi. High paw back!